Show your little one some love on Valentine’s Day with an adorable little Love Gnome by SewnNatural. 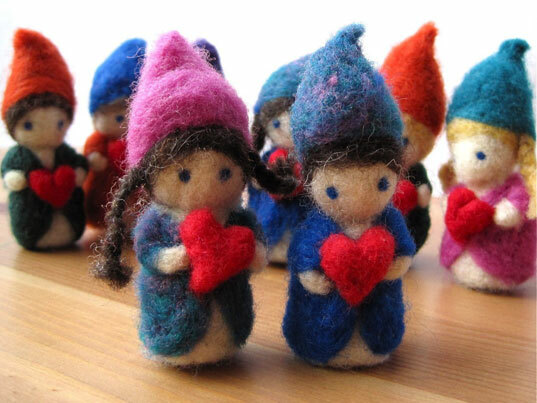 Each 3.5 inch-tall eco-friendly character is needle felted by hand from 100% wool in Ottawa, Canada. The gnomes, with heart in hands, are much more fun than a throwaway paper card. With 12 different styles to choose from — 6 boys and 6 girls — you’re sure to find the perfect Love Gnome for your child. Show your little one some love on Valentine's Day with an adorable little Love Gnome by SewnNatural. Each 3.5 inch-tall eco-friendly character is needle felted by hand from 100% wool in Ottawa, Canada. The gnomes, with heart in hands, are much more fun than a throwaway paper card. With 12 different styles to choose from -- 6 boys and 6 girls -- you're sure to find the perfect Love Gnome for your child.